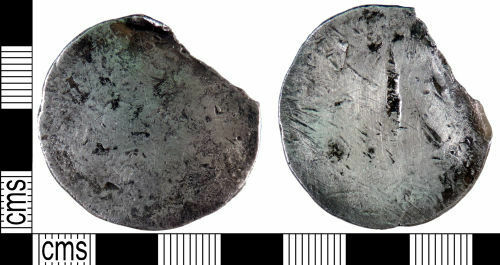 A large silver object, probably a coin, of Post-Medieval date. The object has been worn virtually smooth on both surfaces leaving no diagnostic details. The object is however roughly the right size and shape to have been a half crown of Charles I. The worn condition of the object suggests it may have been used as a touch piece, an amuletic object believed to cure disease and bring good luck.